Along with Rossini’s “Barber of Seville”, the Met in recent seasons has sucessfully presented his lesser known “L’italiana in Algeri”, “La Cenerentola” (“Cinderella”), “La donna del lago” (“Lady of the Lake”), and “William Tell”. 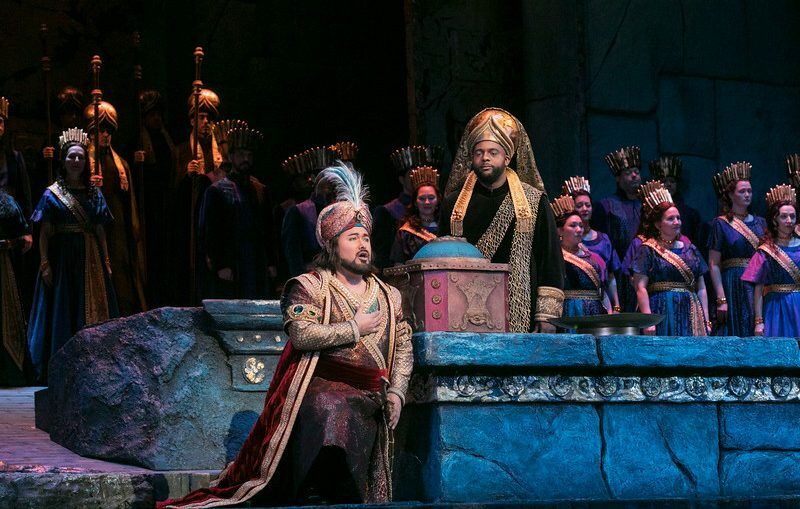 Now after 25 years, his “Semiramide” returns to the repertory. For reasons other than Maurizio Benini and the Met Orchestra’s spunky playing of the opera’s Overture, soprano Angela Meade’s gallant singing of the serial killer Babylonian queen, mezzo-soprano Elizabeth DeShong’s beautiful duets with Meade about their complicated relationship and tenor Javier Camarena’s star turn as the love-struck Prince Idreno, the production also provided an up-close look at how the Met handles an artistic crises. The revival of the 1823 tragedy became news outside of Lincoln Center with director John Copely’s firing early into rehearsals. His dismissal was apparently due to inappropriate comments regarding a cast member. Copley remains listed as the director – the 1990 production is his – with no replacement listed in the program. Therefore, the staging at the February 19 premiere came across as a sincere group effort to make the best of a bad situation. Yet it might have been better if the opera was presented either semi-staged or in concert form with the cast wearing Michael Stennett’s beautifully refurbished costumes. Regrettably, all of the principle performers’ interactions took place at the very edge of the Met’s very large stage. This decision relegated the Met Chorus, unparalleled creators of communal voice and identity, to stand in the background as warriors and maidens with little to do. 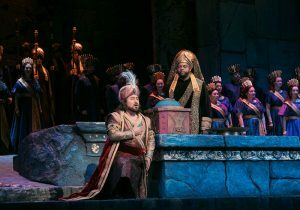 Any opportunity for building tension was lost during the three-plus hours depicting the aftermath of Queen Semiramide’s choice of the young Assyrian commander Arsace (mezzo-soprano Elizabeth DeShong) to succeed her (Babylon was…big surprise… a patriarchy) over Assur (bass Ildar Abdrazakov), the nobleman who helped her murder her husband. This lack of direction also led to something of a grand opera tradition but not necessarily in a good way: the cast sang to the audience instead of each other. Vocal demands are understandable and negligible; not breaking the fourth wall without cause. Meade had several difficult arias, including one that her intended fiance Arsace is her long-lost son, sang them without emotion to her subjects or in solitude. Even a strong singing actor like Abdrazakov did it too – except during his last act aria when he imagines seeing King Nino’s ghost. All of DeShong’s attempts to convey nobilty along with her beautiful singing went unrealized. Only Javier Camarena as the Indian Prince Idreno visiting at a most inopportune time believed in what he sang. When the principles weren’t singing to the crowd, they gazed in awe at John Conklin’s recreation of Ancient Babylon in ruins. While historically inaccurate, the combination of Romantic era ornamentation, silent movie set designs, and Klimt-inspired black-and-gold accessorizing is a visually impressive. It also provided a laugh for more than a few audience members when a dragon’s head poked out of the side of Semirmide’s study. Making a “Game of Thrones” connection wasn’t hard with so much thrown at them and and so little of it working. Running Time: 3 hours and 45 minutes with one 30-minute intermission.